two with Presta valves, which I don’t care for. Popular on road-going touring and racing bikes since time began, Presta valves don’t mix with gas station air pumps or the ones on common air compressors like mine. You can buy adapters to convert them, but that just doesn’t appeal to me over the long haul. So back they went, and the proper ones will be here in a week. Since I don’t care to do without the Aurora for that long, I got some cheapie standard Bell tubes at the local hardware store, along with a small bottle of Slime sealant. That ought to hold me for awhile. How long is hard to say, because these goathead thorns are long and sharp little devils, backed with a flat bottom that gives them the stability and oomph they need to drive through just about anything. I recall my first foray around Quartzsite in year one, and I was patching standard tubes in the Maxxis tires many times, as little as a day apart. A week was as long as I could hope for. Three inner tubes later, including some “guaranteed” Bell self-sealing tubes that were useless, I went for the extra-thick Slime self-sealing tubes and never looked back. The Slime tubes held air pressure over time like nobody’s business, but wow, they weighed a ton. 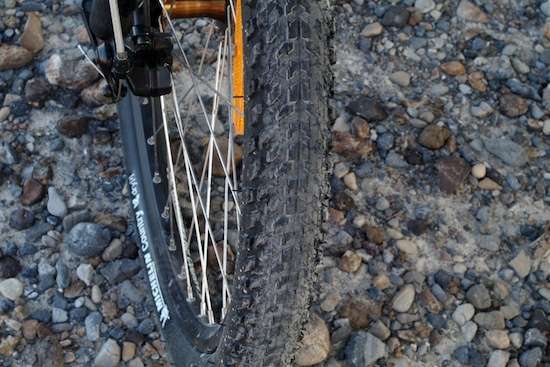 Whether the Dry Country tires and the self-sealing Michelin tubes can equal that puncture resistance is anyone’s guess. I’ll certainly be checking pressures more often, but I’m relying on blind optimism to control the punctures. This story would normally end here. Swapping the tires and tubes in was a breeze, thanks to the ability to quickly disengage the NuVinci gearhub’s controlling cables without tools. Takes a few seconds, and a few turns of the axle nuts with a Crescent wrench drops the rear wheel. The front wheel is released via a quick-change axle that releases by moving a lever and rotating a wingnut a couple of turns. Trying this stunt with a hub-motor bike like the Pedego is a very different story, and is one of the reasons that the mid-drive Evelo models had such appeal for me. I knew I’d be changing out flat tires where I ride. Anyway, reverse the process, pop the NuVinci’s cable ends back into their slots in the gearhub, and you’re good to go. I’d done this before when I mounted the Maxxis tires, and it was nearly as quick and easy as doing the same task on my old Raleigh derailleur mountain bike. I was impressed, though I suspect that the standard derailleur Evelo is even easier to change out, and without even needing a wrench. Tedium alert: What follows may not be of interest if you’re not both an Evelo owner and a confirmed gearhead. This time, I got to the last point of putting the NuVinci’s cable ends back into place, and I couldn’t get enough cable slack to pop the little cable-end barrels into their holders. Hmm. Maybe I’d turned the shift collar on the handlebars, a no-no according to the NuVinci manual. See, two cables come out of there and go all the way back to the hub, to yank a disc in one direction or the other. Kind of a pull-pull system, rather than push-pull. So, some of the cable needed to get both barrels into place was slack that was stuck somewhere between the handlebar shifter and the gearhub. Okay, no biggy. Simply grab each barrel and yank to remove the cable slack, and try again. Naturally, when it didn’t, I made sure that all cable housing tube ends were firmly buried in their holders, since that directly affects effective cable length too. I played with it quite awhile, and I was still short by more than an eighth of an inch. This isn’t rocket science. Find whatever is keeping each cable from playing out its full length, and correct it. After monkeying with and double-checking everything for a very long while, I suspected that maybe something had come out of place within the handlebar shifter, so I opened that up. Nope, everything looked fine, and spun fine as I yanked on each cable back at the hub. The shifter has slack adjusters (which I shouldn’t be needing to touch – the needed cable length was there an hour ago when I started this little project). Still, I thought maybe if I loosened then to artificially get more slack, I could get the other end hooked up and just use it awhile to make the issue either surface or go away. Then put the slack adjusters back where they were. Trouble is, loosening them helped, but not nearly enough. And they were difficult enough to turn that my small pliers needed better access. I had to move the brake handle out of the way, then loosen the shifter’s bar clamp and rotate it to where I could get at the slack adjusters. Between going in to study manuals and researching adjustment videos, I gave up and planned to email Evelo for advice, and was not optimistic about their knowing something I hadn’t yet tried to get slack to reappear. I returned the shifter grip back to its original position, yanked the cable ends back at the hub once more for good luck, and my needed slack suddenly appeared. I popped the two barrels into place at the hub, and returned to the shifter to find that the adjusters could now easily be turned by hand, too. That had to do with how well aligned the cable housings were with the shifter. Relieve the bend tension by playing with the cable housings, and the adjusters spun freely. Where was the slack hiding? I’m not sure, but it seems that the combination of aiming the shifter cables forward with the cruiser-style Nitto handlebars I added, then raising them up several inches higher, puts enough of a bend into the cables that everything binds up just a bit. And the brake cables aren’t that stress-free, either. They all work, but in the long run, the cables are unlikely to last a normal time. My best bet to avoid another go-around like this may be to dump the Nitto handlebar I added, since it’s the main culprit in putting extra strain into the cables. Swapping the Aurora’s standard-issue handlebar back in will not alter grip height (good) but will move the grips forward maybe a couple of inches (bad – for me). I’ll probably try it though, and see how the ergonomics play out in actual use. The cables will certainly be happier. End result: it’s all back together and working again, and I’m back in the saddle. I just need to find an ergonomically acceptable way to both straighten the cables and still keep weight off my wrists, all without introducing side effects like hitting the handlebar with my knees during a turn. None of this little ergonomic puzzle applies to normal riders, since I’m about the only one who is both long-waisted (which pitches me forward) and yet must keep as much weight as possible off my wrists. Still, some Aurora riders have, like me, modified their Auroras to a more upright rider position for comfort by using a Delta stem extender and the Nitto cruiser handlebar. This works, but may not be not the best solution for longevity’s sake. Time to fiddle with things a little more. Sounds great. I’m glad you’re back on the road. Thanks, JR. I must be in some kind of phase where the day just doesn’t feel right unless I’m hopping on the bike for some reason, any reason, just for a little while. Seems to be, Linda. I’m just not sure if the need to do so represents rising to a challenge to improve things even further, or is more of an indictment for what amounts to an ongoing string of failures!